2014 Netgalley & Edelweiss Reading Challenge! Have you ever logged on to Edelweiss or Netgalley with the intention of "Just Looking" and then logging off having requested 5 new titles even though your TBR is a mile long? 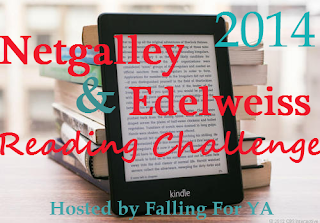 Inspired by Netgalley November the 2014 Netgalley & Edelweiss Reading Challenge will (hopefully) give you the incentive to tackle your review books, stumble upon new ones, and get your Netgalley percentage to the desired 80%! Throughout the year there will be giveaways for Challenge participants, make sure to check in regularly and follow this blog so you don't miss any! Do the books have to be ones we add in 2014 or are they any that we have on our Netgalley TBR list? They just have the be READ in 2014. You could have received them at any time. Are we going to be able to add our reviews at any time, or will it be a 'enter them at the end of the month' kind of thing? That would be great :) Thanks! Great idea :) I definitely need this! So I just want to clarify here-we can add each individual review as we post them during the month? Or would it be better to have a monthly wrap up of sorts? Yes, you can just post each review as you finish them each month. I am going to post the link for each month at the beginning of the month either the 1st or 2nd. Great idea! I can really use this! Awesome challenge! I have so many books on my Netgalley and Edelweiss accounts, I can't wait to finally tackle them all! :D Thanks for hosting! Thanks so much for hosting this! I definitely need it. I always end up having the Edelweiss song from The Sound of Music stuck in my head after visiting the site. At least it's a good song! I am not a book blogger (my blog is mostly about books but I'm never consistent) so I'm hoping this will force me to be consistent with my blog, and like you mention, get me to that elusive 80% review rate on Net Galley. I've taken to mostly only snagging E-ARCs from Edelweiss where I'm pre-approved for many of my most desirable titles, because I'm ashamed of my 56% review rate on NetGalley. ;-) I've been pretty good about not requesting recently, and have gotten organized with a nice little Exec graph, ha ha. Thanks for hosting, Emily! Do you have code for the challenge pic so that I can add it to my sidebar please? Very excited about this challenge! I am going to get to making one right now and I will add the grab code to this post. I don't see a January link yet, but I had to say I just finished my first book for this challenge, Perfect by Rachel Joyce, and it was amazing. I'll be posting my Goodreads review shortly; is that the link I will post here, or is there some way for y'all to see my feedback on NetGalley? Oh, I just realized that my Google screen name is different from my Goodreads screen name. Brandie C = Deborah Craytor, #11 on the sign-up list above. I'm a bit late signing up, but this should help me get to 80% again. I'm late in signing up but this is one of my book goals for this year! It's great seeing that I wasn't the only one that went crazy on my ARC requests! Good luck everyone and have fun reading!! Great idea! Glad I'm not the only one who has ARC pile :D I'm a newbie in blog land I hope you don't mind when I email and/or tweet you about this challenge to ask you questions. Just signed up now. This seemed like a no-brainer to me given how much I do read out of both, especially NetGalley. I do have a few galleys I am behind on, though how some can have a huge pile is puzzling to me given some galleys do have expiration dates (a lot of the graphic novels and comics I get from NG and read do have to be read by a certain date or the e-galley expires). Anyhow, looking forward to see what others are reading. Just signed up and boy, oh boy, do I need this! My NetGalley list is way, way too long!! Just finished A Year With No Sugar by Eve Schaub and will link review as soon as I get it figured out where to link. I'm a little slow on technology and linking stuff so I hope I get it sooner than later. The link up is in the sidebar right underneath the image button for the reading challenge. I hope it's easy enough to find, if anyone else finds themselves having trouble locating it. Let me know! Love this! Thank you so much for thinking of it! Is it just me, or does the button html not work? I'm not that great at it, but it could be me. :) Anyway, I'm jumping in! Hi everyone! I only just joined Netgalley so I guess I can sign up for this now? :) It sounds like a great idea!